Rarely do we see a hair clipper that isn’t just a standalone tool – instead, it’s a whole combination of utilities. Without a single speck of doubt, the king in the do-it-yourself hair clipper niche is none else than Philips. Their Norelco QC5580/40 Pro, an upgrade on previous Philips hair trimmers, collects all you could ever need to cut your own hair at home. Of course, it does suffer from a few drawbacks, too. Let’s take a closer look at it. I want to elaborate why I would highly recommend this rotating fellow to you – despite not being a huge Philips fan. Let the Philips Norelco QC5580 review commence! The first thing you’ll notice about this member of the Norelco trimmer family is its design. How many hair cutters that operate with rotating heads do you know? That’s what I thought too. Philips really have an edge on their competitors here, as it’s exactly this rotating head that makes the Norelco QC5580/40 clipper such a beast. It’s equipped with stainless steel blades – the amazing thing is you don’t even need to care about them. Not only are they self-sharpening (means you won’t deal with oiling them), but they can be easily washed at any time. How? Easy – the set of Philips clippers is manufactured so that you can take the machine apart and simply wash its parts. Extremely convenient and something other brands should think about too. The hair cutter can be adjusted to altogether 14 different lengths. The range is spectacular, as it starts from 0″ (the Philips balder mode) and goes up to 5/8″. You saw that I didn’t mention anything about dealing with numerous attachments, right? You don’t need to concern yourself about such hassles – everything comes built-in. All you have to do is turn the Norelco QC5580/40 clipper’s dial and set your preferred length. It might feel a bit strange the first few times you do it. However, once you get used to the rotating head, you’ll enjoy fast, flexible and easy haircuts. Remember how I tore apart the Norelco QC5130 hair clipper’s atrocious battery? It’s exactly the opposite here. The QC5580/40 electric clipper packs a real punch with its Lithium-Ion battery. Its recharging time is up to the highest of industry standards and allows for up to 60 minutes cordless action. A light indicator will let you know whenever you’re nearing battery depletion. When only around 10-15 minutes of cordless action remain, the QC5580/40 indicator will blink with an orange color to let you know. Very handy and a feature many other cordless hair clippers lack. Combined with the winning body design, the battery shoots this Philips trimmer to the stars as one of the best cordless hair clippers for busy people. The Philips QC5580/40 features a special head shave attachment so you can use it as a balding clipper as well. The combination of quality blades, maneuverable body design and precise cutting potential guarantees a quick and close shave. That said, if you want to achieve the really, really slick bald looks, you might need to run a razor on your scalp too. Few hair cutters have the potency to leave completely naked skin. 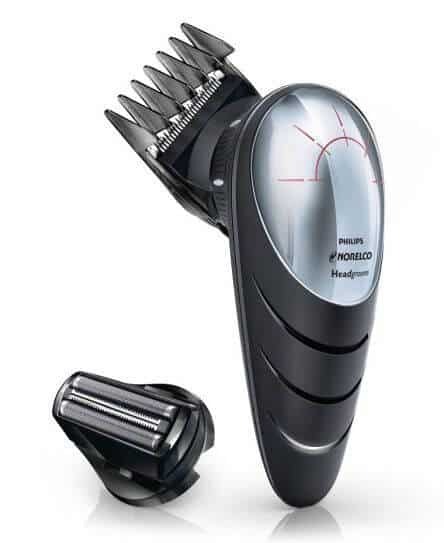 Unlike the more powerful, yet more dangerous Wahl 5 star Balding clipper, this Philips model is very skin-friendly. Its steel-sharpening blades have rounded edges to minimize any risk of you nicking your scalp. This careful approach to full head shaving is extremely important if you suffer from the infamous bumps issue. I know I’ve seen quite a few people shooting for the slick bald look who had such pains. The Norelco head shaver attachment is also ridiculously easy to put on. Just clip it on, rotate it per your wish, and you’re ready to go. 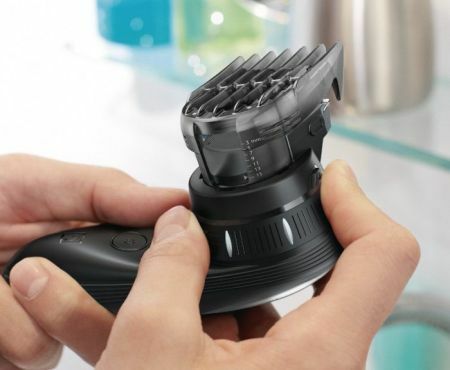 As for trimming action, you can use this set of Philips clippers as a trimmer too. The results are more than good if you don’t need anything too complicated. However, if you want to play around with some fine details, you might have to look elsewhere. 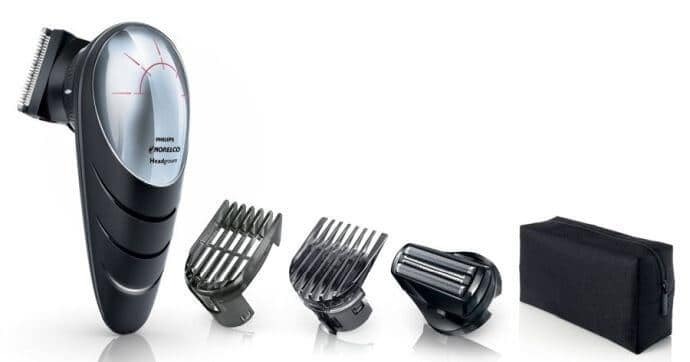 There’s no doubt – this Philips hair clipper is revolutionary in many ways. However, it can’t help but suffer from one very specific shortcoming: its combs. Unfortunately, the electric hair cutter’s combs are made of not that spectacular plastic. That’s a similar problem to the issue that plagues the QC5130 too. The plastic not only looks a bit lacking, but it also tends to bend a little. In other words, you need to be very careful with storing this electric clipper’s combs. Back in the days, I had a medium-budget Philips hair trimmer and it suffered from a similar shortcoming in its accessories. While the blades of this Philips electric clipper are great, the rather average motor leads to some complications. The Norelco QC5580/40 will cut with great accuracy – however, sometimes it might “choke” and fail to cut evenly. Especially on lower lengths you might find yourself needing to go through the same place twice to ensure it’s been equally trimmed. In this Philips Norelco QC5580 review, I have listed the hair cutter’s price as a disadvantage – truth is, it’s not that bad of a price given what this Philips DIY hair clipper offers you. That said, the replacement parts for this model run very expensive too. Aside from the plastic combs I mentioned, there are no significant issues with the hair cutting machine’s body. It’s also pretty long-lasting. Yet, if something happens with it, you’d need to pay some extra. If it weren’t for the plastic combs, this would be in my top 3 of best cordless hair clippers. Even with this issue present, the Norelco QC5580/40 electric clipper will bring you some quality haircutting experience both at home or on the go, as what this Philips Norelco QC5580 review suggests. very nice and complete reviews. What do you think of the PHILIPS HC7460/15 ? We haven’t tried this model, to be honest (and we haven’t seen it in the US either.) At first glance I thought it was a trimmer, instead of a clipper – very trimmerish design indeed. Looking at the specs, they look great on paper: 120 minutes of cordless use is HUGE. 60 settings too – but again, sounds like a clipper/trimmer hybrid, instead of a dedicated hair clipper. Wondering whether there’s not a tradeoff somewhere – in other words, it being a compromise between the two different product types. My main worry in this sense is the blade. It looks very similar to my Philips hair trimmer and I can’t decide whether it can cope with thicker hair types.